وأكدت اللجنة في بيانها أن المؤتمر سيبحث دور الفلسطينيين في القارة الامريكية والشتات حيث تعقد ورش عمل خاصة حول التمثيل السياسي الفلسطيني وتطبيق حق اللاجئين الفلسطينين في العودة ، و دور الحركة الطلابية في الجامعات ، فضلاً عن تنظيم الشبيبة والناشئة وتفعيل دور حركة التضامن مع الشعب الفلسطيني وحملات الدفاع عن الاسرى والاسيرات في سجون الاحتلال. وأعلنت اللجنة عن اكتمال تشكيل لجنتي الاعلام والتواصل على مستوى القارة ، بمشاركة العشرات من النشطاء في المدن الأمريكية والكندية . كما تم إطلاق موقعاً إلكترونياً خاصاً للمؤتمر وتحديد أهم الندوات وورشات العمل واللجان الوظيفية واللوجستية. الفلسطينية الكندية في مقاطعة برتش كولمبيا واذاعة ” صوت فلسطين ” إضافة إلى عدد من أعضاء ولجان مناهضة العنصرية الاسرائيلية وغيرها . ويستضيف المؤتمر عددا من الفنانين والمبدعين العرب وفرقة العودة للدبكة الشعبية والفنانة الفلسطينية نسرين حجاج . وضيوف من فلسطين المحتلة وشخصيات من دول المنافي والمهاجر . ويسعى المؤتمر إلى تنظيم أوسع كتلة ضغط شعبية للنهوض بدور الحركة الوطنيه الفلسطينية في الشتات ولمواجهة الحركة الصهيونية وحماية حق الشعب الفلسطيني في اختيار ممثليه والمشاركة في إعادة تأسيس وبناء هيئاتة الوطنيه الموحدة. On this International Day Against Racial Discrimination, in an historic vote at the largest students’ union in Canada, York University’s undergraduate students’ union, the York Federation of Students, voted overwhelmingly in favour of a resolution to endorse the Global Campaign for Boycott, Divestment and Sanctions (BDS) against Israeli apartheid. The resolution was drafted in response to the 2005 Palestinian civil society call for boycott, divestment and sanctions against Israel as a means to pressure it to comply with international law and to end its occupation of the West Bank and Gaza; allow Palestinian refugees their internationally guaranteed right to return to their homes and villages; and grant equal rights to Palestinian citizens of Israel. With 18 votes in favour and 2 opposed, the board of the York Federation of Students passed the resolution to endorse the BDS campaign, as well as demand that York University abide by the BDS call; specifically urging the University to withdraw its investments from Northrop Grumman, BAE Systems, Amphenol and other companies that are selling weapons and military equipment to Israel . “The oppression of the Palestinian people at the hands of the Israeli state is not some far off issue that we can choose to ignore. We are already deeply implicated in the human rights violations of the Israeli State through our investments in the above-mentioned companies. We do not have the privilege to remain ‘neutral’ on this issue,” said Students Against Israeli Apartheid (SAIA) York collective member Huda Al-Sarraj. In November of this academic year, SAIA York achieved its first BDS success with the passing of a BDS motion at the York University Graduate Students’ Association (GSA). SAIA York now hopes to bring its demand for divestment to the York University Administration by lobbying for the implementation of a socially responsible investment policy. With the support of the GSA and the YFS, as well as the TA’s, GA’s and contract faculty union, CUPE 3903, which passed a BDS motion in 2006, SAIA York will now demand an end to the investment of university funds into companies that profit from violations of international law and human rights. The following piece, by Reham Alhelsi, was published at A Voice from Palestine. We re-publish it here today with greetings, salutes and love to all of the Palestinian mothers who nourish children and the land, nurture Palestinian society, and lead, march and fight in the struggle. On Mother’s day, as the Hannoun wakes up, and as the almond tree blossoms and you wear your green and red dress, we celebrate you. On this day, we celebrate the land, our heritage and our home, we celebrate you mother Palestine, the mother of us all. We celebrate your daughters: our mothers, our sisters, our comrades, who have carried the flame of resistance, protected it and kept it burning. 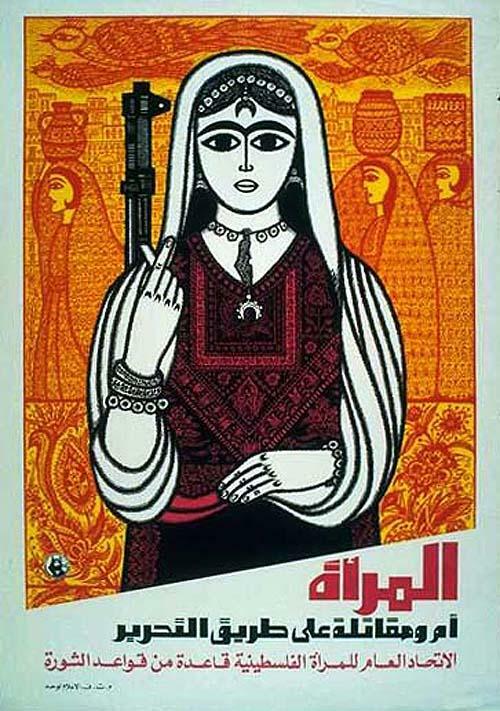 We celebrate your daughters: the martyrs, the prisoners, the injured, the revolutionaries, the workers, the farmers, we celebrate Palestinian mothers. We celebrate your daughters: the mother of the martyr, the mother of the prisoner, the mother of the injured, the mother of the revolutionary, the mother of the worker, the mother of the farmer, the mother of every Palestinian. On this day, as we celebrate the mothers of Palestine, I write to you and to your daughters who are now with you, who have become part of you. On this day, I write to Palestinian mothers who sacrificed their lives for you mother Palestine, those who sacrificed their lives for us. Today, I write to the mothers who were killed while protecting their children, their homes and their land. On this day, I write to the mothers who were killed by Zionist terror gangs, by the brutal occupation with its bullets, tanks, drones, its dungeons, siege and its network of death-traps. I write to the mothers who are always on our minds, whose names we have printed in our memory, whose stories and sacrifices tell your story mother Palestine. On Mother’s Day, tell Hilweh Zeidan that we remember her on this day and every day. Tell her that we remember her courage, defying the bullets of the Zionist terrorists, standing by her husband and her son as they defend their home, as they defend Deir Yassin from the killers. Tell her that when she took her son’s gun, when she stood near her fallen husband and son, when she continued the struggle against the Zionists, Hilweh not only fought to defend her home, she fought to defend every one of us. Tell her that her spirit that feared no death, was our guide over the decades. Tell her that her blood which watered the land, paves the way for liberation. Tell Saliha Al-Halabi that the Zionist criminal who emptied his bullets into her body, killing her and her 9 month old unborn child, has not been brought to justice yet. Tell her that the Zionist criminal who afterwards ripped open her stomach and took out her slaughtered child is considered a hero by the terrorist entity that was built on where her village once stood. Tell her we still mourn her and the pregnant mothers bayoneted in the abdomen while alive. Tell her we still mourn the children maimed in front of their mothers before having their heads cut off. Tell her that 64 years later, her killers still kill Palestinian mothers, still commit massacres, still ethnically cleanse Palestine. Tell her that 64 years later, the Arab brethren still cry crocodile tears over our pain, still sell our blood to the highest bidder and still betray you mother Palestine. Tell her that 64 years later, we remember every victims of every Zionist massacre and every Zionist crime, we repeat the names of every Palestinian massacred, every village demolished, every field uprooted. Tell her that we are united by the pain and the blood of Deir Yassin, Beit Darras, Dawaymeh, Khisas, Sa’sa’, Balad Il-Sheikh, Abu Shusha, Beit Daras, Tantoura, Kufr Qasem, Qibya, Sharafat, Azazmeh, Beit Jala, Qalqilia, Jenin, Gaza, Bethlehem and every massacre committed by the Zionists. Tell her that 64 years later, we have not forgotten, have nor forgiven. Tell her that every day we tell the hypocrite world that it might turn a blind eye, but we will never cease until every single victim receives justice, until Palestine receives justice. Tell her that the march never stopped, and even though some have derailed, the majority has the map imprinted in their hearts, and with every march we come closer to Beisan, to Acca, to Tabariya, to Safad, to Jerusalem. Tell her, dear mother Palestine, that 64 years later, Palestine is as precious as ever, Palestine remains our home forever. On Mother’s Day, tell Umayyah Imran that we remember her on this day and every day. Tell her that the Zionists still kill Palestinian mothers and their born and unborn children at the European-paid military checkpoints. Tell her that her children place flowers on her grave every day, that they sing their kindergarten songs to her. Tell her that her children and the children of every Palestinian mother killed at Israeli checkpoints don’t fear these death traps, but repeat the oath given to their mothers; to remain steadfast, to continue the struggle. Tell her that on the spot where she was left to bleed to death, the poppies defy the death traps and bloom every spring, brining a promise of hope and justice. Tell her that students, workers and farmers are still humiliated at the checkpoints, are still hunted down by killers hiding inside towers. Tell 16 year old Fahmi Al-Darduk, that his mother still cries over her only son, shot at an Israeli checkpoint and left to bleed to death, his only crime was listening to music from his cell phone. Tell 22 year old Bahsar Al-Qadiri, who was stopped at the death trap, tied and thrown into a pit and forced to stay there under the scorching sun until he died, that his mother has kept his room and his university books as he had left them, that she kisses his picture every day. Tell Nada Hussein that her 8 children celebrate Mother’s Day every year at her grave. Tell her that the Israeli soldiers who killed her still prevent patients from reaching hospitals, still delay them at checkpoints, leaving them to die a slow and a painful death. Tell Kamla Ash-Sholi that her two children keep asking about her, keep asking their father why the Israeli soldiers who shot their mother at the checkpoint for no reason were not punished. Tell her that Nahil Abu Raja still mourns her stillborn baby Zaid, killed by the checkpoint. Tell her that the mother of Khalid Mousa, the mother of Jamila and Huda As-Safadi, the mother of Aminah and Fatima Al-Qadi, the mother of Rawan Hreizan and many others still mourn their children, still remember them playing with their toys, still remember the day they were born, still remember the day they were stopped at Israeli checkpoints, prevented from reaching hospital and their children left to die while Israeli soldiers laughed. Tell 18 year old Kifah Zu’rub that his screams and cries still ring throughout his home, that his mother remembers every minute and every second of that day when her son was attacked by Zionists’ dogs, and prevented at the checkpoint from reaching hospital, how despite the injuries he was turned back home to die a painful death. Tell her that while Palestinian mothers and grandmothers are humiliated and killed at Israeli checkpoints, Arab brethren extend their hands to the killers. Tell her that while Palestinian pregnant women are forced to deliver at the roadside under the eyes and laughs of Israeli occupation soldiers, Arab brethren continue to talk about dignity, about “honour”. Tell her their cries for help and their screams of pain are music to the Zionists and fall on the deaf ears of the Arab brethren. Tell her that as life slips away, as they close their eyes, the world turns a blind eye. Today, on Mother’s Day, tell her dear mother Palestine and tell every Palestinian mother, that their cry for justice will never be silenced. Tell them that we won’t rest until we seek justice for Aisha Nassar, Rihab Nofal, Laila Baheiri and Rana Al-Jayyousi and every Palestinian victim. Tell her that we mourn with ever mother who lost a child, mourn with every child who lost a mother. Tell Fawziyyah Ad-Darak we remember every patient prevented from reaching hospital, every patient killed at Israeli checkpoints. Tell her we mourn her and mourn Khadra Mustafa, Fatima Ash-Sharafi, Basim Ar-Rimawi, Aisha Hasan, Safia Qandil, Khatima Abdel Rahman and every Palestinian patient left to die at the Israeli checkpoints. On Mother’s Day, tell Wujdan Khalid that the Zionists still kill us with their American-paid poisonous gas. Tell her they still kill unborn Palestinian children, like they killed her 9 month old stillborn son Sa’d. Tell her they celebrate killing Palestinian mothers and their unborn children, they promote it and sing of “killing two for the price of one”. Tell her their racist minds see Palestinian babies as a “threat” that should be eliminated, and see Palestinian mothers as “weapons’ factories” that should be “demolished”. Tell her that they still throw gas canisters into homes, into crowded refugee camps, shoot them directly at protesters. Tell her that they still drown funerals with poisonous gas, that they still target schools and hospitals. Tell her that their poisonous gas still strangles mothers while in their kitchens baking bread. Tell her that their poisonous gas still kills the trees and silences the birds. Tell her that we mourn her, remember her, and remember Aziza Jabir, Dawlat Al-Masri, Amira Abu Askar and Nabila Al-Yaziji, Shukriyeh Faris and their unborn children. Tell her that we mourn and remember Amnah Darwish, Fatma Al-Walidi, Shamieh Jarrar, Fatma Salman, Kamleh Sharaf, Subhiya Mankush, Watfa Farajallah, Na’ima ‘Adi, Fatma Al-Khawaja, Rabi’a Ash-Sharafi, Khadra Abu Salameh, Khayriyah Alawneh and every mother killed by Israel’s poisonous gas. On Mother’s Day, tell Wafa’ Ad-Daghmah that her children still see her lying on the ground in a pool of blood, still tremble at the memory of that day when Israeli occupation forces blew up their home and killed their mother in front of their eyes. Tell her that her blood refuses to be forgotten, her pain refuses to be silenced. Tell Manal Al-Batran and her 5 children that the Zionists still occupy the sky over Gaza, still occupy the land and the water. Tell them that Gaza homes are shelled by bombs and missiles while the so-called PA talks about freedom and liberation. Tell them that Palestinian schools in Gaza are targeted with illegal weapons while Arab brethren race to normalize with the Zionists. Tell them that Palestinian children in Gaza sleep to the noise of drones, and mothers don’t sleep at all, hug their children and try to protect them from the next missile. Tell them that Gaza says farewell to her children almost every day, while those who claim to represent us fight over chairs and imaginary posts. Tell them that Gaza stands alone and defies the daily Zionist terror while Arab brethren meet to coordinate new NATO invasions of Arab land. Tell Zeina Al-Awawdah and her 3 children that the world remained silent when the Zionist missile blew her and her children into pieces. Tell them that world leaders did not announce that they “cry with the people of Palestine”. Tell them that the so-called PA sold their blood without a wink of an eye. Tell them that the Arab brethren don’t even condemn Israeli crimes anymore. Tell Hayat Sheikh-Khalil that Gaza is still besieged. Tell her that the siege still kills Palestinians, still makes widows and orphans. Tell her that Palestinian mothers have to watch their children die a slow and a painful death, and fathers have to hear the cries of their children and not be able to do a thing. Tell her how young people, once full of hope and determination, wither in front of their parents. Tell Huda Al-Khawaja that her killers are welcomed in every world capital. Tell her that leaving her to bleed to death in front of her 5 children and preventing medical treatment was termed “a mistake”, for whom no one is to be charged or punished. Tell her that the world saw her die slowly, saw her children plead for help, heard the Israeli soldier say in front of the camera that they were doing “purification” work in the refugee camp, and the world remained silence, turned a blind eye. Tell Mariam Ayyad and Wajiha Rabay’a that their children have a million mothers now. Tell them that Palestinian mothers continue to protect their children from Zionist missiles, bombs, bullets and dungeons. Tell them that Palestinian mothers continue to rush and save Palestine’s children from the Zionist kidnap gangs and the death squads. On Mother’s Day and on every day, tell them, mother Palestine, that we mourn them, we remember them, we remember their sacrifices, we won’t forget the crimes. Tell them that we continue the fight for our and their freedom, for our and their rights, we continue to seek justice for us and for them, no matter how long it takes, because justice will prevail. On Mother’s Day, tell Maryam Makhtoub and Najla’ Syam that Al-Aqsa is still in danger. Tell them that Zionist raids have increased while the actions of Arab brethren in support of Al-Aqsa remain non-existent. Tell them that Jerusalem is being ethnically cleansed, Judaized while those who claim to represent us “negotiate” over the colour of their VIP-cards. Tell them that Palestinian mothers still dream of the day when their children will be free, when Palestine will be free. Tell them that Palestinian mothers are forced to give birth inside Israeli dungeons while “PA” and Arab officials dine and wine in Tel Aviv, and while the whole world whines over the violations of human rights committed everywhere, but not those committed by the Zionist entity. Tell them about Intisar Al-Qaq, Majida Salaymeh, Umaymah Al-Agha, Samiha Hamdan, Mirvat Taha, Manal Ghannam, Samar Sbeih and Fatima Az-Ziq. Tell them that Palestinian mothers are kidnapped from the midst of their children, dragged away from the warmth of their homes and thrown into dungeons. Tell them how Palestinian mothers are harassed, tortured, isolated and threatened with their lives and the lives of their loved ones. Tell them about Iman Ghazzawi, Ibtisam Il-Isawi, Ireena Sarahneh, Qahira As-Saadi, Latifa Abu Thra’, Muntaha At-Tawil, Kifah Jibril, Hanan Al-Hmouz and Samha Hijaz. Tell them that the Zionist entity holds trials for the victims it killed, sentenced them and keeps Palestinian martyrs hostage. Tell them about Dala Al-Mughrabi, Darin Abu Eishah, Zeinab Abu Aalim, Hanadi Abdel Malik, Wafa’ Idris, Ayat Al-Akhras and Hiba Daraghmeh. On Mother’s Day, tell Fatma Ghazal and Fatma Abu Dayyah and all your daughters that Palestinian mothers continue to be the spearhead of resistance, continue to be the guardians of the land, continue to be the teachers of the revolution, continue to the leaders, the marchers, the freedom-fighters. Tell them that Palestinian mothers don’t fear the machine gun of the Zionist colonists, don’t fear the tank of the occupation soldier, don’t fear the interrogation cells of the dungeons. Tell them that Palestinian mothers are the martyrs, the prisoners, the farmers, the workers, the protectors. Tell them that Palestinian mothers still cry for their children, still talk to their children’s pictures on the wall, place a Hannoun over their children’s graves. Tell them that Palestinian mothers hold back the tears, but can’t hold back the waves of longing, can’t stop the pain. Tell them that when a Palestinian martyr is carried to our mother, to Palestine, over the shoulders of thousands of comrades, every martyr becomes the child of a million Palestinian mothers, and a million tears fall for him/her, and a million zaghroota are sung for him/her. Tell them they are our mothers, the daughters of Palestine. On Mother’s Day, tell my grandmother Mariam that I remember her every word and her every song about the land. Tell her that her smile is my constant companion, her courage and dignity my protecting armour. Tell her that I walk with her in Jrash, I hold her hand where my grandfather’s house once stood, I see her apple tree and her flowers. Tell her that the keys have not rusted, they are sacred and that the return journey to Jrash began the minute she was forcibly expelled from her home under the rush of bullets. Tell her that Jrash is closer than ever, though it might seem far away. Tell her the road to Jrash is clearer than ever, though it might seem blocked with so many obstacles. Tell her that her grandchildren are loyal to her legacy, carry her will in their hearts next to Palestine. Tell her that their compass points only towards Jrash. Tell my grandmother Aishah that I remember our walks up the hills, remembers her singing traditional songs. Tell her that her fig tree is still steadfast on the hill, standing in defiance, facing the illegal Zionist colony and the military checkpoint. Tell her that the olive trees that were burnt down to ashes have grown, have defeated death and are reborn, have defied uprooting and still cling to the land. Tell her that the land beyond the checkpoint and the barbed wire misses her, asks about her. Tell her that the lands asks: when will freedom come? On Mother’s day and on every day, tell your daughters who have become part of you, whose bravery guides us, that we remember them, that we see them in the eyes of every Palestinian child, in the smile of every Palestinian mother, in every Hannouneh and in every olive tree. Tell them that the mothers of Palestine will continue to raise freedom-fighters, martyrs, prisoners and revolutionaries. They will continue to raise Palestinians, sing to them the songs of Palestine, tell them about Haifa and Beisan and Safad, teach them that Palestine will always be one from the River to the Sea, that rights are not begged for but are taken. They will continue to lead the struggle for a free Palestine, free from the River to the Sea, for they are your daughters, mother Palestine. A full day festival celebration of the cultural richness of the Palestinian people! We know the struggles. We know the politics. We know the pain. Do we really know the talent of the people? It is time to celebrate the contributions Palestinians make to society through their art, film, food, products, knowledge, literature and their music. Our evening event will especially highlight their vibrant comic scene by featuring the amazing talents of MAYSOON ZAYID & ARON KADER! Featuring Maysoon Zayid & Aron Kader with local Edmonton talent. All proceeds donated to the LEAP Program for Palestinian refugee youth in Lebanon. 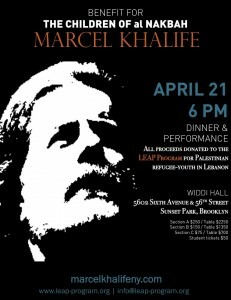 If you cannot attend, please consider making a generous tax-deductible donation to support the educational empowerment of Palestinian refugee youth in Lebanon (www.leap-program.org/donate). To learn more about LEAP, please watch this video (http://youtu.be/OiXvRZT38Is). 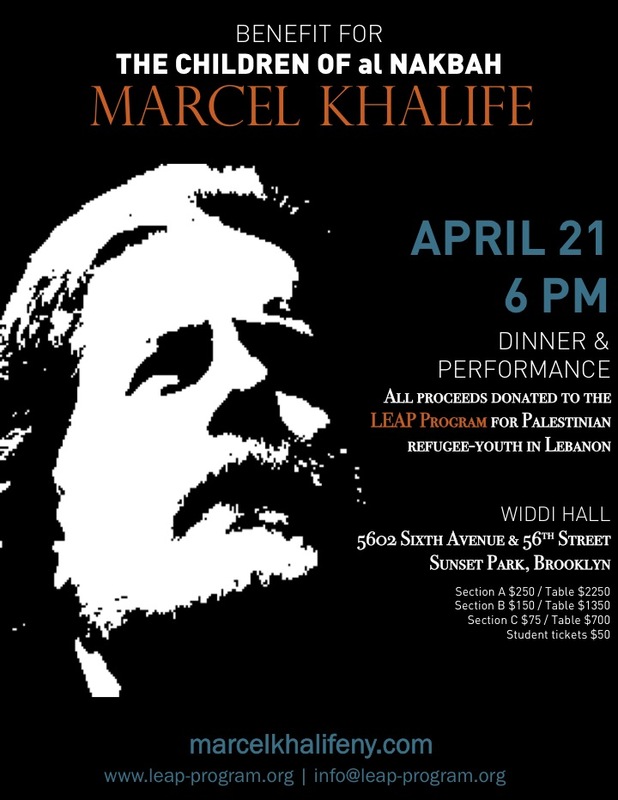 MARCEL KHALIFE is a distinguished composer, singer, and oud player that is best known for liberating the oud, an instrument integral to Arabic culture, from its traditionally strict techniques, expanding its musical possibilities, and contributing to its artistic and cultural revival. Over the decades, Khalife’s music and his own compositions have signified peace, reconciliation and breaking boundaries. He creates a sound that is always innovative, inspiring, and beautiful. Many of his recordings utilize traditional instruments mixed with western mainstays depicting a sophisticated musical marriage of classical Arabic and jazz music. As a composer, he demonstrates a deep attachment to and a profound understanding of the power of the written word. Khalife has distinguished himself not only as a virtuosuo oud player but also as a talented composer. Khalife’s educational and humanitarian contributions are as numerous as his creative endeavors. A tireless promoter of the arts and culture in the Arab world, he has been the recipient of many prominent awards and has performed in the most prestigious music venues in the world. In his quest to renew the vibrancy and significance of the Arabic song, he has based songs on the words of some of the great contemporary Arab poets, particularly the Palestinian poet and journalist who eloquently wrote of the exile, struggles, and hopes of the Palestinian people, Mahmoud Darwish. The following article was written by Omar Shaban, a member of the Conference organizing committee and of Solidarity for Palestinian Human Rights at UBC (SPHR-UBC), the conference hosting group at the University of British Columbia. This article was inspired by the poorly written article in UBC’s official newspaper The Ubyssey. There is no doubt that when an oppressor – no matter who they are – fails to make a good “moral” case as to why they are oppressing a certain person, or a group of people, this oppressor will try to find ways to reconcile between what they perceive as a necessity to oppress and the necessity to rebrand this oppression as a necessity. This is especially true when it comes to the Zionist oppression of the Palestinian people inside and outside of Historic Palestine. The Zionists have always tried to work on the two fronts I mentioned above: the necessity to oppress and the necessity to rebrand the oppression as a necessity. The perceived necessity to oppress is a very distinctive feature of the Zionist movement inside and outside of Palestine. Since the beginning of the Zionist project, earlier Zionists had no qualm with inflicting suffering and misery upon another population in order to advance their narrowly defined political project. From the perspective of Theodore Herzl, it was absolutely acceptable for the Zionists to displace an entire population, remove them from their roots and replace them with an entirely alien population using false rhetoric such as “a land without a people for a people without a land.” Successive leaderships of the World Zionist Organization expressed similar sentiments – sentiments that were later transformed into actions that culminated in the ethnic cleansing of over 750,000 Palestinians from their land. The oppression of the Palestinian people continued to be a necessity for the the Zionist project even after the creation of the Israeli state on stolen Palestinian land. For Israel to be a democracy and Jewish at the same time, the state must maintain a Jewish majority which means two important things: 1) keeping the Palestinians who were forcibly expelled from Palestine in 1940s outside of Palestine, and 2) creating laws, rules and regulations to control and exclude the Palestinian who remained inside of Palestine. Zionist rhetoric maintains that the Jewish state has, since day one, been facing an existential threat levelled against her by the brutal totalitarian regimes of the Arab world. Right after what they term as “the declaration of independence” (independence from whom? I am not sure), the newly born Jewish state was “invaded” by Arab armies bent on the inhuman objective of eradicating the only Jewish state in the entire world. The Jewish state has had to defend itself from her haters after this failure of an invasion numerous times – first the Zionists had to find methods to ward off the attacks of the Palestinian Fida’iyeen (self-sacrificers) whose activities were sporadic and disorganized, then they had to deal with a resurgent Palestinian National Liberation Movement represented by Fatah, then they had to fight the Arab armies in 1967, then an increasingly popular Popular Front for Liberation of Palestine in the late 1960s and early 1970s, then a united Palestine Liberation Organization (PLO) in the 1980s and an Islamic Resistance Movement (Hamas) in the late 80s and early 90s. Because of this imminent threat against Israel, because of the numerous and systemic attacks against it, and because this state is isolated in a sea of Arabs who are fuelled by hate and anger, Israel has a right to not only defend itself, but also attack whom it perceives as a threat – and that can be combatants and freedom fighters as well as their support base which includes civilians, their properties, their schools and playgrounds and their entire livelihood. Over the past hundred and so years, the Zionist quest to rebrand and promote the necessity for oppression has undergone an extremely significant transformation. In the beginning, the Zionists sought to convince the leaders of Europe of the worthiness of their “cause” using the language of Realpolitik and necessity. The leaders of Europe must support the Zionist project despite their flagrant anti-Semitism because it is in their political and economic interest to do so. From the perspective of earlier Zionists, this necessity had to become the norm; a norm that allows them to operate around the political and economic structure of Europe, as well as within this structure. If the Zionist project is indeed a political and economic necessity, then the only intelligible course of action is to support it and this is what happened. It began with the Kaiser of Germany allowing Herzl to present his ideas, to the political leaders of Switzerland allowing him and his supporters to hold their first conference in Basel, to supporting and facilitating Zionist immigration to Palestine, to convincing Britain to promise the creation of a Jewish homeland in Palestine, and eventually to creating a Jewish state after a long campaign of systemic ethnic cleansing. 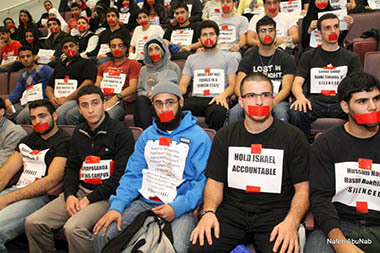 Now the quest to promote Zionism is taking place on University campuses. Barely an event organized by a Palestinian solidarity group on university campuses passes without invoking the need to have “constructive and meaningful dialogue” and forgetting about the divisive issues and focusing on moving forward and achieving “peace” (whatever that means). This insistence on “constructive dialogue” is indicative of a strong desire by the Zionists to pacify and neutralize any resistance to advancing the Zionist project. University students are now taking the lead and initiative to debunk all the Zionist myths – historical and current – about the reality of the situation in Palestine. The boycott, divestment and sanctions (BDS) campaign against Israel is gaining ground in virtually every higher education institution all across the globe as students are becoming more aware that the last bastion of Western imperialism is an entity that should not be allowed to exist in its current form. More students are becoming more aware of Israeli war crimes and crimes against humanity in the Gaza Strip and the West Bank, and of the systemic racism Palestinians with an Israeli citizenship face on a daily basis, and of the unjust and inhumane repression that Palestinian refugees have been enduring in their host countries for six and a half decades. This increased awareness of the Palestinian predicament is making the Zionist promotion of their project more difficult as it poses a moral threat to the very foundations of this project. Thusly, rebranding the oppression of the Palestinians as a necessity becomes a necessity. Every crime perpetrated by the Israelis against the Palestinians and the areas where Palestinians are is framed within the context of self-preservation, protection and fighting an existential threat. Israel, which is facing this existential threat, cannot be reduced to a mere colonial entity created for the sole purpose of advancing the geopolitical interests of Western powers in the region – there is more to this “tiny state.” It is a state for its Jewish citizens who share a collective identity and a shared history represented by food, dance, culture, and music. These citizens are not merely political and military objects necessary for the maintenance of the regime, they are global citizens with achievements that span all disciplines, cross borders and boundaries and challenge pre-conceived notions. This elaborately fabricated structure which includes economic, financial, scientific and educational institutions was put in place by a people who have been yearning for emancipation for thousands of years; an emancipation that they finally attained in Palestine – a land which was apparently empty and a desert before the Zionist settlement in it. Such is the discursive dichotomy of the Zionist modus operandi. It is a dichotomy based on rewriting history, falsifying facts and disseminating propaganda to promote and legitimize a racist ideology. And this is why we can’t be friends with the Zionists. The fundamental premise of any friendship – no matter how deep or shallow it may be – is a mutual understanding, a shared empathy and a genuine sympathy with the experiences of the other. Such a framework does not exist when it comes to the Zionist oppression of the Palestinians. The relationship between the Palestinians and Zionists is that of an oppressed with their oppressor. In this case, the oppressor is not only seeking to eliminate the Palestinian national existence from both consciousness and history, but it is also seeking to normalize this eradication through a vicious campaign that depends on an interdependent duality – 1) the legitimization of oppression and the existence of the oppressor and 2) the delegitimization and demonization of the oppressed and their mere existence. President Obama’s visit to the occupied Palestinian territory comes at a time when our prisoners are waging a hunger strike battle in the face of Israeli government obstinacy, and in the face of US silence towards the slow murder these heroes are being subjected to. Most recently Palestinian prisoner Arafat Jaradat died during interrogation inside the Israeli prison of Megiddo. Moreover, the visit comes in light of the continued international isolation of Israel and the ever-increasing boycott campaigns against it. On one hand, it is simply naive to presume that U.S. policy toward Israel has changed since Obama took office. A March 2012 report by the U.S. Congress discusses a $3.1 billion in military aid for the year 2013 only, including financing the Iron Dome system, and increasing US bilateral support to Israel to $115 billion since 1949. In addition, the US is committed to maintain Israel’s security at the expense of the lives, land and livelihood of Palestinians; whether by justifying the massacres against Palestinians in Gaza, or through its silence concerning settlement expansion, destructions of homes, forcible transfer and other Israeli policies. On the other hand, it is hypocritical and disingenuous that the Palestinian Liberation Organization (PLO) disregards the role of the Obama administration in blocking its membership request in 2011 at the Security Council, and its vote against the resolution at the General Assembly in 2012. 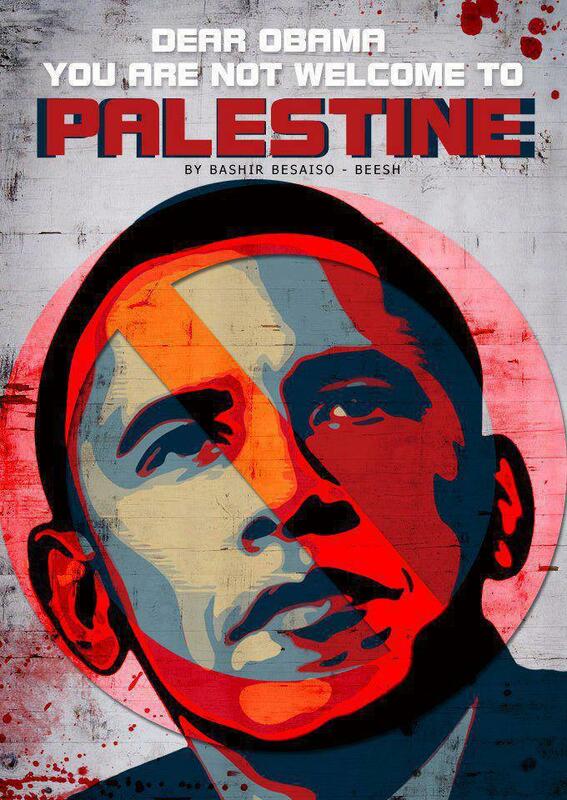 Furthermore, the US congress has imposed financial sanctions on international institutions recognizing “Palestine”. And to add insult to injury, while the PLO/PA assure Palestinians they consider Jerusalem the Palestinian capital, yet they receive the US President in the Ramallah enclave. Despite the attempts of the Palestinian “leadership” to ease the atmosphere, with statements about Obama pressuring the Israeli government on the issue of Palestinian political prisoners, or promises of petty US aid, however, the ultimate objectives of the visit are clear. The visit aims to achieve three goals; first, to relieve the pressure off the Israeli government, which is suffering increased international isolation (albeit with words more than actions). Second, to restrain the frustration of the Palestinian street simmering in solidarity with Palestinian prisoners and finally, to prolong the expected lifetime of the PA, which after 20 years is becoming more and more disconnected from its people. The Palestinian people will not accept to play a role in achieving these interests, and will not succumb to these pressures. What is required of us as Palestinians is to persue a complete boycott of our occupier on all fronts: security, economical, political, cultural and academic, and to rebuild a representative entity for Palestinians everywhere. Not aid in relieving the pressure on the Israeli government by engaging in a futile process, and allowing it to complete its expansionary policies and annexation through uprooting Palestinians from their land and homes. Accordingly, we call on the masses of the Palestinian people to change this path and demonstrate against receiving he who considers Israel “the closest ally in the region”, and to refuse the return to futile negotiations. We call for entrenching the sacrifices of the martyrs and prisoners by refusing to surrender and to work with Palestinians everywhere to establish a strategic program of resistance, where political, economic, military, popular and various other forms of resistance and duties are shared each according to their ability. REGISTRATION NOW OPEN: Save with the special Early Bird rate! CLICK HERE TO REGISTER TODAY – SPECIAL EARLY BIRD RATE AVAILABLE! 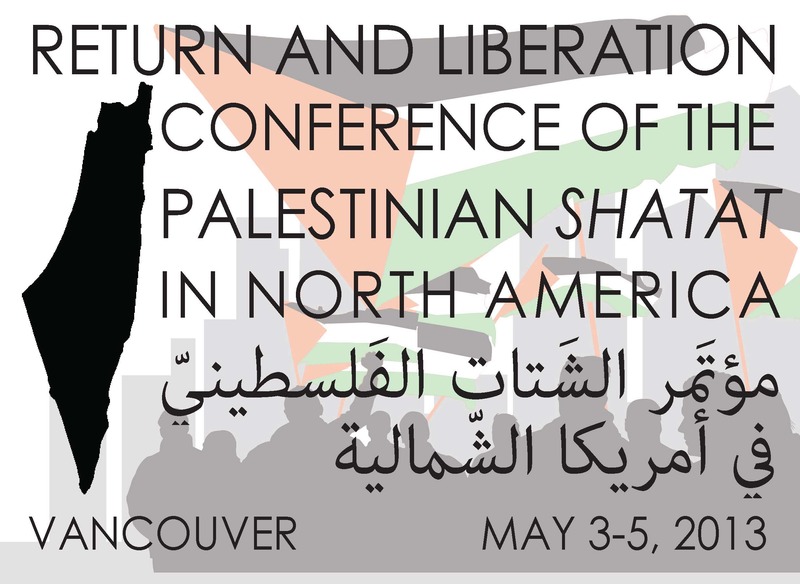 Registration is NOW OPEN for the Conference of the Palestinian Shatat in North America! 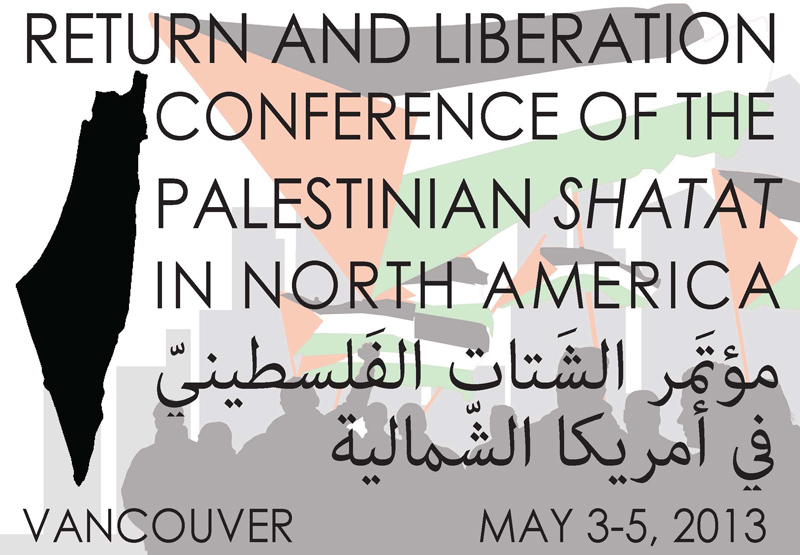 This conference – which will take place at the University of British Columbia in Vancouver on May 3-5, 2013 – will bring together Palestinian and Arab organizers, activists and community members to discuss our collective role as Palestinians in our liberation movement and assert our voice as Palestinians in shatat/exile. There is more information about the conference at our website, palestinianconference.org This conference is being organized from the ground up, and will benefit from the active involvement and participation of Palestinian organizations and organizers across North America. The conference will include facilitated workshops, plenary discussions, conversations, and presentations – it welcomes your participation, your voice, and your active involvement in reclaiming the voice of the shatat. Registration closes on May 1st. We will soon be posting accommodations information. If you have any questions, or require solidarity housing, please email us at housing@palestinianconference.org. The PLO is historically regarded as the sole legitimate representative of the Palestinian people, an overarching mechanism by which we all came together to deliberate on the strategies of our national movement. In this plenary, we will discuss the histories of political representation in our national movement, and what representation might mean today. Some of the questions addressed will include: What did the PLO look like, what does it look like now, and how/can it be remade? What can we learn from our earlier revolutionary histories? How has the current lack of representation impacted our struggle, and our ability to develop a coherent and cohesive national strategy for liberation and return? How do we create representation bodies that are inclusive of all our people and forces, and serve the needs of our national movement? How do we embody our demands for popular and democratic representation in our own communities and associations? This plenary will examine Palestinian organizing in the shatat, looking at the past and moving to the present day. We will discuss the reasons and implications for how different methods and mechanisms came to frame our organizing as part of our liberation movement, and consider frameworks moving forward. Some of the questions addressed will include: What have been the organizing trends within the history of our movement? What has been the historical role of students, workers, and women? How do we forge our role and revitalize our sense of national responsibility in the shatat? How do our communities currently organize? What internal and external challenges are confronting our communities? How do we build community accountability and organizing discipline? How can we imagine and strategize ways to connect our organizing in North America with our brothers and sisters on the ground and in exile? This is a critical time for the Palestinian people and the national liberation movement, and this conference is an opportunity to connect, build and mobilize our people in North America. Conference participants will not only gain knowledge, but are expected to commit themselves to collectively and democratically working together to re-build and revive our national liberation movement. CLICK HERE TO REGISTER TODAY – Confirm the special Early Bird Rate! The Organizing Committee of the Conference of the Palestinian Shatat in North America is pleased to announce that the Conference will take place from Friday evening, May 3 through Sunday afternoon, May 5, at the University of British Columbia in Vancouver, BC, on unceded Musqueam territories. The host organization for the conference is Solidarity for Palestinian Human Rights at UBC (SPHR – UBC). Conference sessions will be soon forthcoming with more details, and will include plenaries, workshops and cultural events. 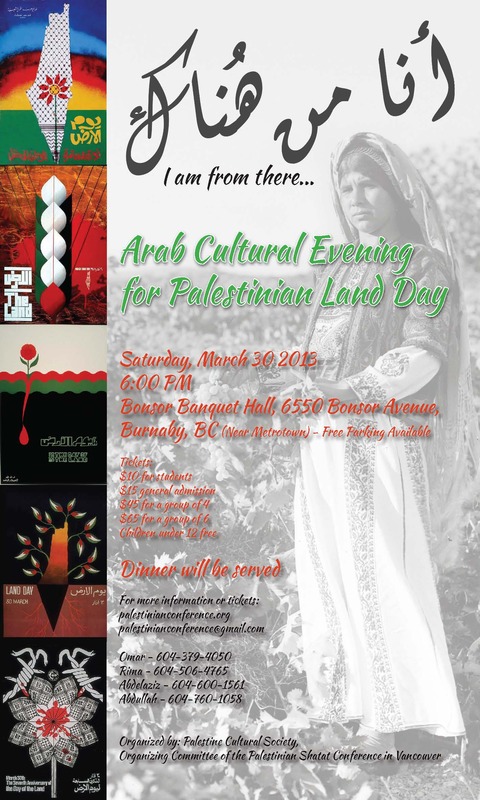 Join the Palestine Cultural Society and the organizing committee of the Vancouver Palestinian Shatat Conference for an Arab cultural evening commemorating Palestinian Land Day – experience Palestinian culture as we celebrate our connection to the land. The cultural evening will be held in Bonsor Banquet Hall in Burnaby, BC. Children are welcome – bring your family! This is an evening for community celebration, solidarity, and cultural resistance. Tickets on sale in advance and at the door: $15 general admission, $10 for students, $45 group rate for a group of 4, $65 group rate for a group of 6. Children under 12 free. Proceeds will support the Conference of the Palestinian Shatat in North America, taking place in Vancouver May 3-5, 2013!